The Porsche Cayenne is my favorite automotive troll. Porsche fans were horrified at the idea of a Porsche SUV only to discover that the Cayenne is ridiculously capable off-road, on-road, on-track, and even when towing. The all-new 2019 Porsche Cayenne is faster and more powerful than ever, and if you’re still mad about the idea of a Porsche truck, take this advice: drive one. The Cayenne wasn’t the first luxury über-SUV to hit the market, but it quickly became a benchmark for every automaker looking to capture the masses of Nordstrom parking lots and upper-middle class school drop-off zones everywhere. But while some luxo-trucks were comfortable, or fast, or okay off-road, the Cayenne did the best job being a total package. That theme seems to be continuing for 2019. The Cayenne drives like a supremely comfortable and fast car while still offering ample tow capacity (7,716 pounds! ), competence at speed and the ability to hop, skip and scramble its way up steep gravel trails with minimal driver effort. There’s a whole lot of exciting engineering that makes the Cayenne mighty, but the real reason Porsche’s engineers have given it so much attention is the fact that it pulls its weight and then some in improving Porsche’s bottom line. The big Pepperwagen didn’t just exceed Porsche’s sales expectations, but nearly doubled in sales with its sleeker, lighter, more refined second generation. The 2019 model kicks off Porsche’s third generation Cayenne and even though expectations are higher than ever, I think the SUV’s setting up to impress all over again. A menu in the 12.3-inch high-definition central infotainment screen lets you optimize the SUV for various kinds of terrain: on-road, mud, gravel, sand or rocks. This tweaks the chassis settings and differential locks for a noticeable improvement in ride quality over harsher unpaved roads. The extra lift in gravel mode is pretty significant, as I had to stretch to step in and out of it a bit. It also allows the truck to have an impressive amount of suspension flex should you decide to park with one wheel atop a pile of gravel to satisfy your inner bro. The $1,130 Sport Chrono package doesn’t just add a silly little stopwatch on the top of the dashboard—it also makes it easier to switch drive modes. A rotary selector—first used in the Porsche 918—is right on the steering wheel to select the different modes. Normal mode is for everyday driving, letting the Cayenne shift smoothly to higher gears quickly to save fuel. Sport mode shortens the transmission shift times to speed up faster, turns auto stop/start off and sharpens the steering just a little bit. Sport Plus makes the steering, power delivery and transmission response even more aggressive, putting the truck in its lowest possible suspension setting. It also enables a “Performance Start” launch mode for accelerating quickly away from a standstill. On the Cayenne Turbo, Sport Plus also activates the auto-adjusting roof spoiler. In the center of the Sport Chrono’s dial is a button that activates 20 seconds of maximum engine output, which essentially acts as a “push-to-pass” function. Or an arcade-style super boost button. Regardless, it works and it’s awesome. The base Cayenne actually seemed to be the smoothest, with the boost from its single turbo 3.0-liter V6 engine gliding on with less drama than than the others. If you’re more used to naturally aspirated engines, the base model is the one to have. It puts out 340 horsepower and 332 lb-ft of torque, good for a 0 to 60 mph time of 5.9 seconds according to Porsche. It’s an increase of 40 HP over the last base Cayenne and drops the 0 to 60 time by 1.7 seconds. The base Cayenne also has a bit more power lower in its rev range than the more powerful engines offered, which made low-speed maneuvering noticeably better in that model for me. If you miss the kick-in-the-face style boost delivery of an older 944 Turbo, you’re in luck. The Cayenne S and Cayenne Turbo both have twin-turbo engines with plenty of good old-fashioned turbo lag. Keeping it in boost yields ludicrous speeds. Flooring it and laughing like a maniac when boost kicks in never gets old. The Cayenne S has a 2.9-liter twin-turbo V6 rated to 440 HP and 406 lb-ft of torque and a 0 to 60 time of 4.9 seconds. The Turbo has a 4.0-liter twin-turbo V8 engine with 550 HP and 567 lb-ft of torque, giving it a 0 to 60 mph time of 3.9 seconds making it even faster than the previous-generation top-tier Cayenne Turbo S.
The Sport Chrono package also decreases the 0 to 60 mph times thanks to its launch control function: 5.6 seconds for the base model, 4.6 seconds for the Cayenne S, and 3.7 seconds for the Cayenne Turbo. Go forth and embarrass smaller cars, my friends. And we do mean smaller cars. The Porsche Cayenne doesn’t feel like the behemoth it is when you drive it. There’s a hint of understeer in fast turns, as you’d expect an all-wheel drive, front-engine car to have, but it doesn’t feel like a wallowy wad of inertia as other larger crossovers and SUVs often do. The base model has a curb weight of 4,377 pounds, with the Cayenne S and Cayenne Turbo weighing in at 4,454 pounds and 4,795 pounds, respectively. The Cayenne is fed power by an eight-speed shift-by-wire Tiptronic S transmission made for quick, smooth shifts. It responded near-instantaneously even when I used its paddle shifters to manually shift gears, despite not being a more high-end dual-clutch setup. 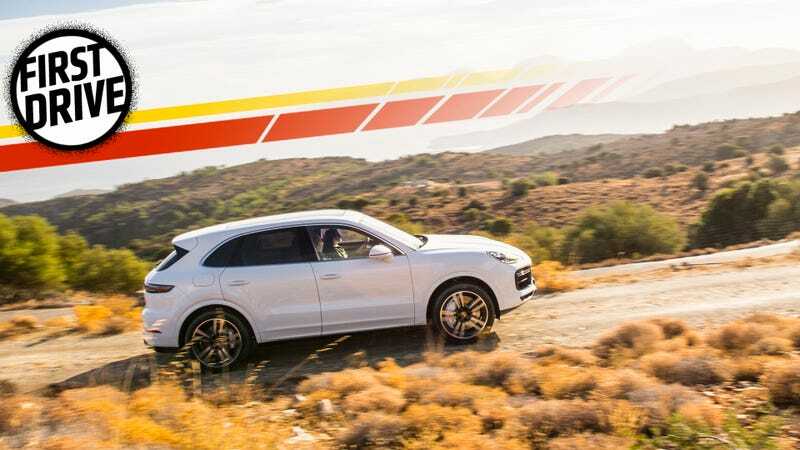 The Cayenne actually hits its top speed in sixth gear, with longer seventh and eighth gears used more for comfortable, fuel-sipping highway drives. The increase in speed and power commands a small premium over the current-generation Cayenne. The base model now starts at $65,700, the Cayenne S starts at $82,900 and the Cayenne Turbo starts at $124,600. Options, as ever, cost extra. A lot extra, if you get excited with the catalog. Although some popular tweaks will be lumped together in to-be-determined bundles for the U.S. market. Clearly, the Cayenne handles extremely well despite its size, pulling off some kind of bizarre engineering voodoo that I don’t think any other SUV has been able to emulate just yet. It’s also easy to live with, which has always been the Cayenne’s true killer app. We accidentally made a wrong turn into a small village in Crete (auto writer problems!) in the Cayenne S, where the pre-car streets were barely wide enough to drive through, and we ultimately had to turn around in a narrow opening between two cottages. The 360-degree cameras and easy-to-read proximity sensors made turning around far easier than it should have been in that giant jellybean of a vehicle. There’s a host of good little features that make this car so easy to live with like that. Hill-hold prevents you from rolling backwards on steep inclines. Active roll stabilization eliminates up to 0.8 G in roll in turns, begging you to take corners faster. Soft, power-adjustable leather seats have meaty bolsters for those fast turns and adjustable lumbar support. Even the rear seats offer heating and cooling, plus their own HVAC controls. The truck is also always online through an LTE connection, which comes standard. The interior is a bit too form-over-function for me this time. While the console thankfully clicks to tell you you’ve hit a button, it also doesn’t have any physical separation between many of its “buttons,” forcing you to look away for a second to double-check that you’ve got the right feature. The placement of some of the buttons, such as the “recirculate” feature for the HVAC system that’s on the other side of the shifter altogether, just didn’t feel intuitive. While many other functions (such as the navigation system, vital car stats and a lap timer) could be displayed in the customizable screens to the left and the right of the tachometer, the radio wasn’t one of them. Seems like a glaring oversight. The navigation system was occasionally confusing, telling you to “prepare to turn...” miles ahead of the actual turn. It struggled with some of the Greek names on Crete (one was even pronounced as “Greek letter Greek letter...”) where we did our test drive, but I guess we’ll give it a pass for comedic value. Additionally, the new Cayenne’s steering feels a little synthetic with the faintest hint of elecro-mechanical feedback that makes its presence more known in the more aggressive drive modes. However, it had a nice weight and feel to it, and accurately communicated what was happening to the wheels below. There’s one vital function we didn’t get to test out on our test drive: towing. I’d really like to tow with this. It’s the ideal tow vehicle that doesn’t drive like a tow vehicle, and this latest generation is more powerful than ever. My hunch is that the smooth power delivery of the base model would be best for tow duty, but we’ll have to see for ourselves. Perhaps a lesser-used but still hilarious function we didn’t get try out is the Cayenne’s track performance. The active aero spoiler on the Cayenne Turbo was no doubt working hard on Crete’s delightfully twisty backroads, but does it make a noticeable difference on track for the average track day bro? When you need to win the Great Tow Vehicle Lap Time Throw-Down, these things matter. Also included in the latest generation are all manner of Porsche Connect Plus connectivity options, which displays real-time traffic information in the navigation system and allows you to control key features for the SUV through a mobile app. I played with the app demo and chuckled about being able to remotely set off the Cayenne’s horn, but I didn’t really get to dive into it in detail. Being able to make sure your car is locked from farther away sounds great, but is it really that big of a deal or more of a neat parlor trick? We’d have to use it more to find out. I need a Porsche Cayenne. I’ve spent far too many hours tinkering with the Cayenne configurator to examine which shade of brown goes best with various desirable options for muddin’ and towin.’ And oh man, I’ve watched the depreciation of used ones like a hawk. Someday, I will tow my Porsche with a Porsche. Myth confirmed. The Cayenne is too good. Isn’t it time that we all accepted the fact that Porsche makes an incredibly good truck? I Have Needs. Cayenne Needs.